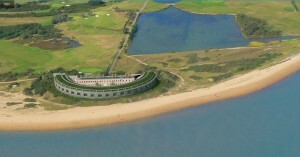 Dominating the east end of Stokes Bay, on the headland known as Gilkicker Point, is a large earth mound which hides beneath it a Victorian masterpiece of defence engineering, Fort Gilkicker. 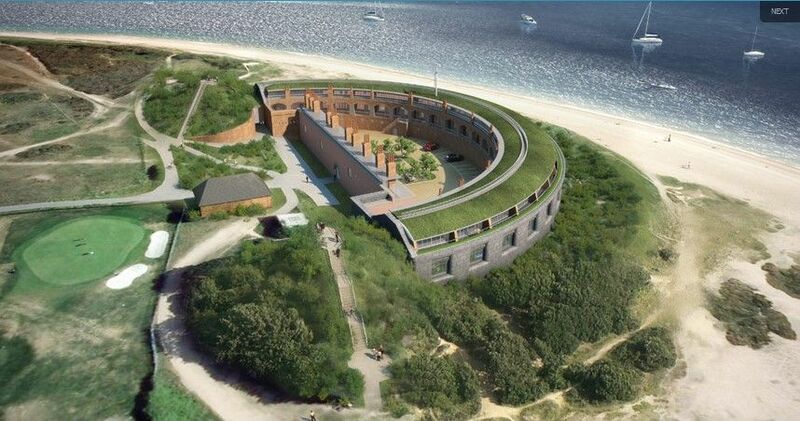 The present Fort Gilkicker replaced an earlier one constructed in 1856 on the same site, this was known as Monckton Auxiliary Battery. 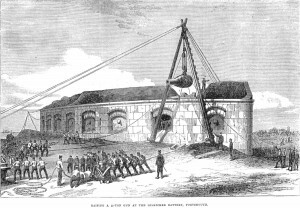 The Royal Commission of 1860 recommended that the first battery should be extended and strengthened, instead a new fort was built and its name changed to Fort Gilkicker. 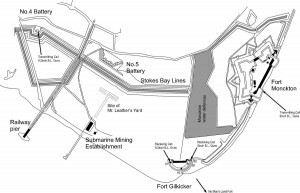 It was intended as a coast defence battery to cover the beach at Stokes Bay, already defended by a line of ditch and rampart with five flanking batteries, known as the Stokes Bay Lines, and the deep water anchorage off Browndown as well as the inner approaches to Portsmouth Harbour. 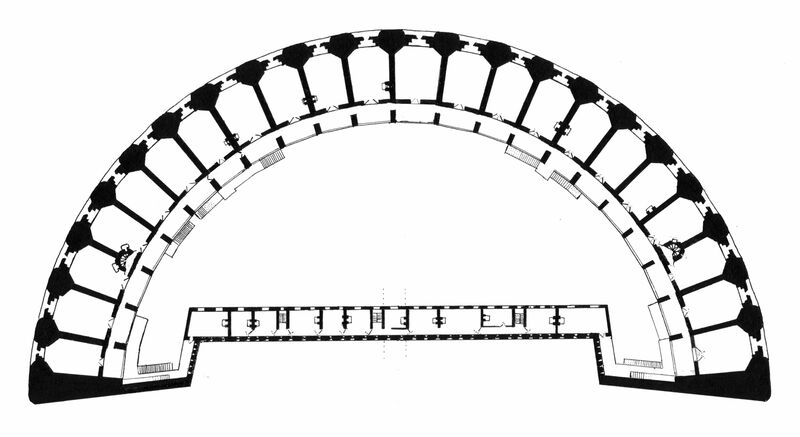 It was proposed as ‘a casemated battery of curvilinear form for 26 guns on one tier’. It was to direct its principal fire on Stourbridge Shoal and the flanks on Spithead and Stokes Bay. It was commenced in June 1863 and following the failure of the contractor it was recommenced in 1865. By then the plans had been revised to allow for iron shields in the casemates and iron shields to protect five guns on the roof. The contractor who took on the completion of the fort was J.T. Leather. He already had a construction yard nearby at Stokes Bay from where he had constructed the huge granite and iron fortifications that can still be seen out in the sea at Spithead. 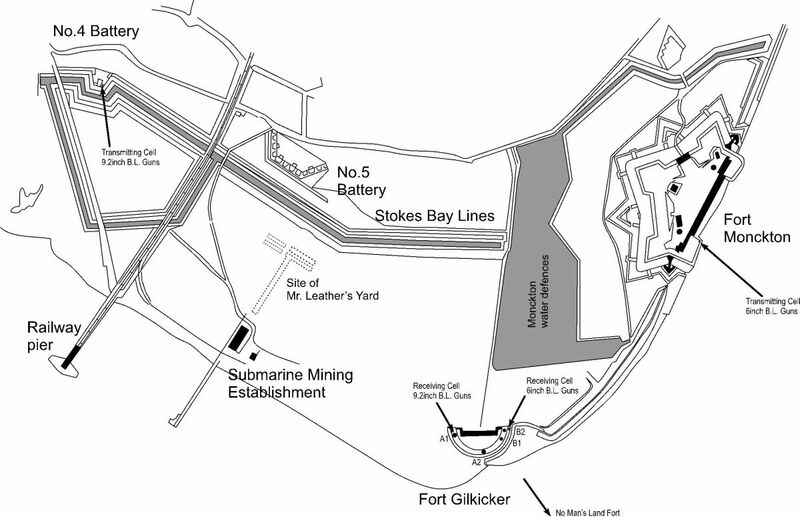 By 1871 Fort Gilkicker was complete, except for its iron shields that protected the guns. In the lower casemated battery an armament of ten 10-inch and five 9-inch R.M.L. guns was fitted by 1886. Five gun positions were constructed on the upper battery, three for 11-inch guns of 25 tons on ‘C’ pivots in positions 2, 3 and 4 and two for 12-inch guns of 25 tons on ‘A’ pivots in positions 1 and 5. A defensible barrack closed the rear of the fort. This was loopholed for rearwards defence. The basement, under the main sea facing gun casemates, contained the magazines allocated equally to shells and cartridges. 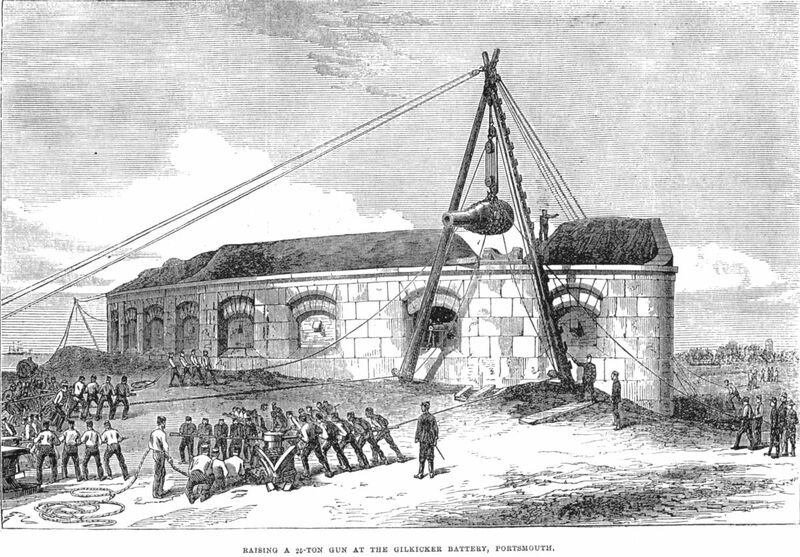 In 1888, following the recommendations for all sea batteries, some of the casemates were filled with concrete to act as traverses. 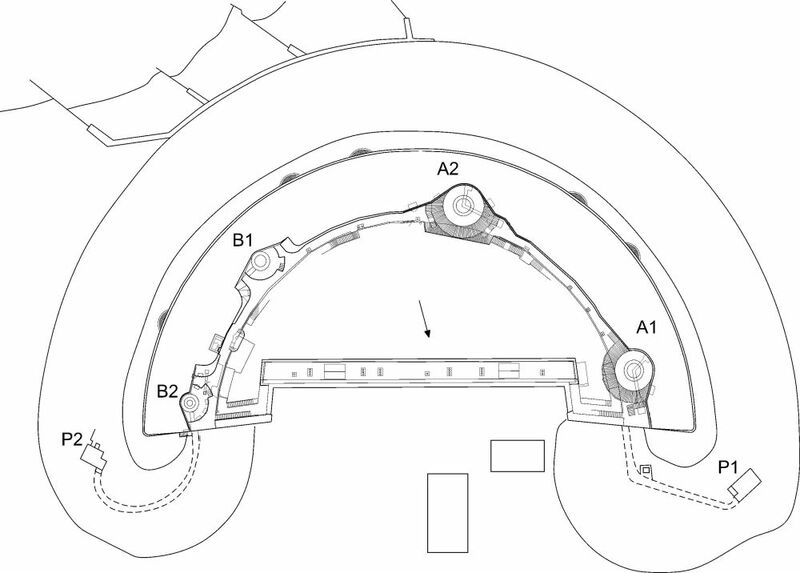 Fort Gilkicker Plan of 1871 showing the gun casemates in the lower battery. The magazine arrangements were also modified. By 1898 the RML armament was obsolete and it was proposed to mount the latest Breech Loading guns on the roof instead. These were in place briefly from 1902 until 1906. Fire control of the guns was achieved using a system of Position Finders each with a transmitting and receiving cell. At this time the casemates were obscured by an earth bank, covering the gun ports, which is still in place. This was to give greater protection to the ammunition stores which were now in the old gun casemates. The bank also gave the fort some measure of camouflage but has meant that no one alive today has seen the beautiful curve of granite casemates beneath. The guns were declared superfluous to requirements by the Owen Committee in 1905 and they were removed. the fort continued its life as a married quarter for Royal Engineers station nearby in Fort Monckton and at the R.E. The fort was briefly used in WWII as a signal station relaying a vast number of messages to and from the Allied beaches in Normandy during Operation Overlord. In 1956 all Coast defences were declared obsolete and the fort passed into the hands of the Ministry of Public Buildings and Works. It became workshops for a while. It was also used as a store for submarine parts as an extension to HMS Dolphin. It was finally declared superfluous by the Military and was bought by Hampshire County Council in 1986. 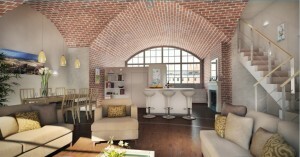 The intention was to convert it for modern use as high quality apartments. It was used briefly as a store for building materials but continued to decline, although it had been made an Ancient Monument and a Listed Building in an attempt to preserve it from unsympathetic development or complete destruction. A scheme was proposed by Try Homes to convert the fort for modern usage. This fell through and a second scheme was proposed by Prince Charles’s Phoenix Trust. This in turn failed due to lack of time and a third scheme was proposed in 2010 by Askett Hawk under the name of Fortgilkicker Developments, to convert the fort to luxury apartments. This was given planning permission following a public enquiry. In November 2016 planning permission for the conversion was extended for a further three years. In December 2016 it was announced that Wild Boar Developments have finally agreed a deal with the former land owners to transform Fort Gilkicker into the 22 townhouses and four luxury flats in what will be a £20m project, and hope to complete the project in the next three years. A beautiful Victorian structure, that has had a long and important history in the development of coast defence, lies forlorn and forgotten by all but the few who pause to look as they walk past its eroding grassy banks. Beneath lies a vast and magnificent granite fort pierced by twenty two gun ports waiting to be uncovered for all to see for the first time in over a hundred years. The gun casemates viewed from the parade ground in 2015.